My husband James and I were childhood sweethearts and got married shortly after he had joined the military. We wanted to have kids right away, but that wasn’t so easy for us. Between infertility issues and several overseas assignments, we never were able to grow our family. We found ourselves at a crossroad in our life, and we had to face it…we were not so young anymore! We found The Barker Adoption Foundation and became excited about their older-child adoption program. I’m sure they got tired of my many questions, but they were so supportive throughout the entire process. 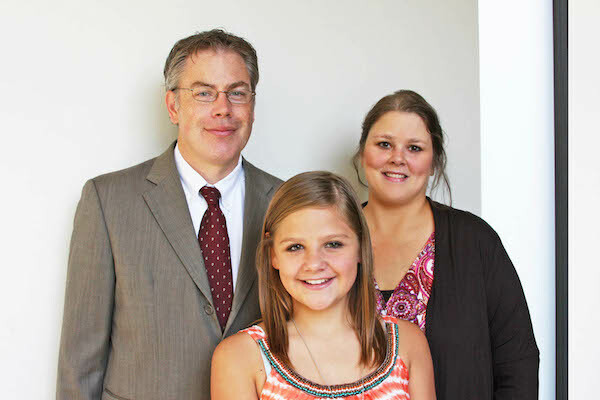 It was springtime when, with absolute delight, we were chosen as the parents of a 10-year-old girl named Jamie. She had already stolen our hearts with just her profile and a couple of small photos. As we received more information and got to know her better, we were astonished at the similarities we discovered. We think she even looks like us (which wasn’t what we had searched for), but the similarities don’t end there. Jamie’s name sounds like a combination of both our names (James + Tammy = Jamie). She and I also share the same middle name. We are both left-handed, like to scrapbook, and have the same pencil-stabbing accident scar (we both are prone to bizarre accidents too, I guess!). She has connected with her dad through video game banter about who reached the highest level and their love for thrilling roller coasters! James and I are both enjoying our role of being her parents! Meeting our daughter for the first time brought about many emotions not unlike a “first date” would. We were excitedly nervous and wondered if she would like us. After all, she is her own person and had a difficult past. We were prepared for her to have uncertainties and fears. She was appropriately guarded at first, but little by little we saw her become more relaxed and make true connections with us even when we had to enforce the family rules as she pushed the limits. I was recently reading past journal entries that I had written, and they brought back the memories of our many “firsts” together. For the first time, Jamie had an entire year at the same school, adopted her very own puppy, started her own savings account, has gone on a family vacation to Disney World, and we have been lucky to experience it all with her. You could say we did things a little backwards. James retired from 20 years in the military, and then we met our daughter…but she was well worth the wait!